George R. Stewart’s Earth Abides has been named (by James Sallis, among others) one of the finest dystopian, after-the-fall novels of all time, and one of the finest American novels. Its long history of popularity — never out-of-print (thanks to Alan Ligda), for nearly 70 years — shows the influence of the work. Recently I read two books which, to me, stand alongside Earth Abides in the ability to inspire thinking about the possible end of human civilization. One, a novel, is told from the point of view of an Amish farmer. The other, a history and adventure, looks to a past collapse to speculate about how civilizations have ended just as Stewart foresaw – due to disease. When the English Fall is David Williams’ novel about Pennsylvania’s Amish country after a massive solar storm destroys all things electrical. There’s no power to run vehicles, freezers, hospitals, lamps, washing machines, or radios and computers. The Amish are not much affected by the end of industrial civilization – at least not initially. They send their surplus food to the starving people in a nearby city, continue to farm and can, and pray for strength and deliverance. But soon the city’s population runs out of food, and begins to move toward the Amish community in often-violent raids. The Amish must face the possibility that they may have to choose between their peaceful ways, and the survival of their friends and families. Their choice is not for me to reveal here. But the book’s ending is hauntingly similar to that of Earth Abides. The novel is written in the first person – pages from a journal found later. It feels Amish in style – gentle, reflective, spiritual, loving. While Earth Abides has a power sometimes called Old-Testament biblical and intersperses the narrative with short poetic passages that can feel like psalms, the quiet style of the journal supposedly written by a deeply religious person feels more like the quiet New Testament conversations Jesus has with followers. Author David Williams is a Presbyterian minister who enjoys hoppy beer and dirty motorcycles – sounds like someone worth meeting. But he understands his hero, Jacob the Amishman as a man of belief, and is able to communicate Jacob’s ideas in a way that will reach all readers. The Lost City of the Monkey God is NOT fiction. It is a journalistic report of a real expedition to discover lost cities in Honduras. But it is written by someone who is an experienced and best-selling novelist, who knows how to keep his audience involved to the point of reading into the early hours of the morning. Douglas Preston tells the story in good journalistic fashion combining the space-based perspective of LIDAR with the grungy, dangerous, slow cutting through a snake-infested jungle so dense that an expedition member could get lost within a hundred yards of the others. Then, in an interesting finale inspired by what happened to the explorers after they left the jungle, the book becomes an ecologically-based work which in the best STEAM manner weaves together archaeology, history, pre-history and speculation to suggest a reason why these cities – and perhaps other ancient Latin American cities – were so quickly and inexplicably abandoned. Again, this is no place to spoil the book’s conclusion. Yet, like When the English Fall, it is powerfully evocative of Stewart’s great work. In fact, it is almost as if The Lost City of the Monkey is a prequel to an ancient version of Earth Abides. Like Earth Abides, these two books are ecological works which look at the interconnections between humans and the ecosphere. I highly recommend them to anyone influenced by George R. Stewart’s Earth Abides. And to anyone who enjoys a smashing good read. The attached text is from the comments section, but I wanted to highlight here. It came this morning, quite by surprise. 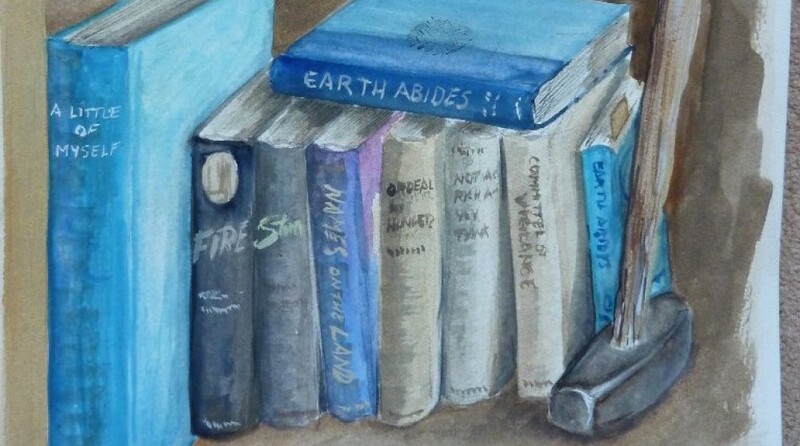 Like the comments by other distinguished authors including Christopher Priest and James Sallis, it reminded me why I slog along this path of the honoring of George R. Stewart and his great novel, Earth Abides. My original intention was to edit the message. But it is so integrated that it shall stand as sent. The only change is to add links to Terence Green and his work. I’m a Canadian writer and teacher, born in 1947, currently in my 12th year of teaching creative writing at Western University in London, Ontario, Canada (this London is a city of some 300,000, 2 hours south-west of Toronto). Before that, I spent 30 years teaching high school English, primarily in Toronto. I’m also the author of 8 books [That’s a review of one] (7 novels and a collection of short stories). I bought and read the Ace paperback of EARTH ABIDES back in the early 60s (62? 63?) as a high-school teenager, and was duly impressed… So impressed, I might add, that I still have that particular 50-cent edition (more than 50 years now) on a bookshelf here in my office — an old favorite, and probably a collector’s item of sorts. I rank it with A CANTICLE FOR LEIBOWITZ — also never out of print — as transcending any genre, moving people, and opening eyes — touching the mind and the heart, as the best literature does. When I spotted the trade paperback edition published by Del Rey about a decade ago, I bought it and re-read it. I was impressed once again. It more than held up. And just recently, I read it for the 3rd time, still moved and impressed — enough to search the internet for more information on Stewart. This is how I found and ordered your book. I just wanted you to hear yet another story of how far-reaching his work has been, and by extension, how far-reaching your own appreciation has been. Many thanks for the scholarship (and work) involved in spreading the word. I like to think there’s a potential, significant, continuous groundswell for the book, and that it will indeed abide long into the future, like Ish’s hammer. And you’ve helped. Thanks to Terence Green, and to all those who understand the greatness of George R. Stewart and Earth Abides; and who take the trouble to let others in the “Fellowship of the Hammer” know their feelings. When George R. Stewart was a boy, wandering through the treasures in the family attic in Indiana, Pennsylvania, he found a copy of the book, Treasure Island. He took it downstairs, opened it and began to read. It changed his life. He became fascinated with maps and mapping, inspired by the map to pirate’s treasure. Years later, he may have learned that Stevenson was similarly in love with maps; and he often mapped a story out first and then let the tale unfold as the map directed. Like Stevenson, Stewart would become an author of place, of geography, and of maps. Stevenson’s book stayed with Stewart. When he was at UC Berkeley, working on his Master’s Degree, two fine professors helped him discover his style of writing and his subject – the geography and history of the west. He decided to write a Master’s Thesis which would combine the two. Treasure Island came to mind. There was some evidence that “Treasure Island” was, in fact, located in the landscapes and history of the greater Bay Area. (One giveaway was the presence of rattlesnakes among Coast Live Oaks in the novel.) Stewart decided to use the internal evidence from the novel, research into Stevenson’s writings, and field research to see if he could discover where the Island was located. Stewart found Treasure Island. The wave-swept beaches were the shores of Monterey Bay. The Coast Live Oak forests backed the Bay. The flat-topped mountain, Spyglass Hill, was Mount St. Helena, where Stevenson and his bride Fanny spent their honeymoon. And the abandoned mine where the Stevensons spent their honeymoon gave Robert Louis Stevenson the name for one of his characters – one of the great characters of English literature. Stewart had discovered not only the landscapes; he’d found Long John Silver himself. If you visit the Napa wine country of California, it’s a short but winding drive north from Calistoga to “Robert Louis Stevenson State Park.” Hike the short Memorial Trail to find a plaque memorializing the Stevensons’ honeymoon – placed where the mine cabin, the Old Juan Silverado mine cabin, stood. Or you can choose longer hikes which wind around and up and down Mount Saint Helena. Afterward, visit one of those fine Napa Valley wineries and raise a glass of the wine Stevenson described as “bottled poetry” to celebrate your discovery of Treasure Island, and your meeting with Long John Silver himself. For more information about Stevenson’s time in California, visit the pages of the Robert Louis Stevenson Organization. Before you visit the park, review this page from the Robert Louis Stevenson Museum. And read The Silverado Squatters, Stevenson’s record of the California years. If you read the version edited by James Hart, From Scotland to Silverado, you’ll find George R. Stewart honored in the “Introduction” for his re-discovery of Treasure Island . As at Donner Lake, Stewart’s research and writing were the foundation for a California state park. After Robert Louis Stevenson died, his widow, Fanny Stevenson, built a beautiful home on Hyde Street, near winding Lombard Street, on that long stretch of hill made famous by the Powell-Hyde Cable Car. The house eventually went to Noel Sullivan, a member of the family of Mayor James D. Phelan. Sullivan turned the place into a center of learning and the arts, holding frequent gatherings that included many members of what Ansel Adams once called “The Northern California Enlightenment” [or words to that effect]. Robert Louis Stevenson would have found that use most satisfying.